Camberwell North West was a borough constituency located in the Metropolitan Borough of Camberwell, in South London. It returned one Member of Parliament (MP) to the House of Commons of the Parliament of the United Kingdom, elected by the first-past-the-post voting system. 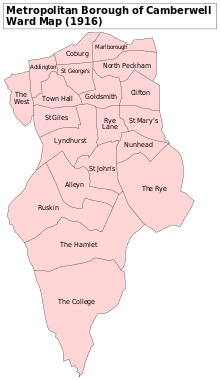 The Metropolitan Borough of Camberwell wards of Addington, Lyndhurst, St Giles, Town Hall, and West.